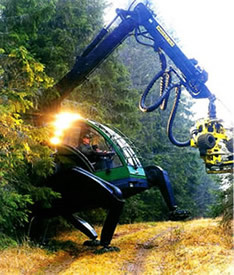 State-of-the-art mechanized harvesters are proving to be an ecologically sensitive way to log the forest. Since 1989, the use of Scandinavian-style harvester and forwarder machines for thinning and selection logging has been gaining acceptance across the Northwest region. Professional loggers have added this new tool to their toolkit because it affords thinning harvest without damage to soils, streams, wildlife habitat or standing trees. This new system, commonly referred to as "cut-to-length" because of its mechanical cutting of logs, presents a unique opportunity to thin individual trees from forest while minimizing impacts. 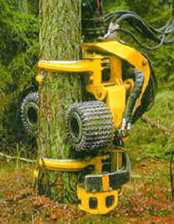 The "harvester" machine severs the tree from the stump and cuts it into logs in a continuous process. The "forwarder" machine then carries, or forwards, the logs to the roadside where they are loaded onto log trucks. The long reach of the loading arm on the forwarder machine minimizes the number of "skid" trails needed in a harvest area. Mechanized harvesting, and other new technologies sweeping the logging industry, demand that today's logger have the skills of an engineer, forester, manager, mechanic, and equipment operator. 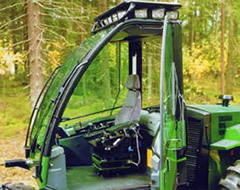 To efficiently run the mechanized harvester requires ample training and experience, as well as genuine respect for the land -- a respect common to loggers who rely on caring for the forest for their livelihood. The "harvester," which looks like a moon-vehicle from the movie Star Wars, is equipped with an on-board computer, a control panel resembling an airplane cockpit, and two joy sticks used by the operator to direct the movements of a mechanical 'log processor head' on the end of a long telescopic arm. Logger Gary Betts, co-owner of More Logs, Inc., Sweet Home, Oregon, has been logging with a harvester-processor system since 1992 -- and likes it. Says Betts, "Cut-to-length is a logging tool that's suited to manage Oregon's second generation forests. It protects ecosystems by eliminating soil disturbance, it leaves limbs to recycle nutrients, and it frees overcrowded trees so they stay healthy. At the same time it processes valuable logs as small as two inch diameter -- logs that used to be left in the woods because they were too small." Forest scientists and professionals alike embrace mechanized logging as a value-added intensive forestry practice. Mechanized logging is an added tool that actually employs more workers recovering smaller logs to meet America's growing wood demands. Logs once too small to harvest, are now affordably utilized through improving woods technology. While opponents to logging say that harvesting shouldn't be done in our forests, today's modern loggers and foresters understand that a variety of techniques, like thinning, smaller regeneration clear-cuts, wildlife trees and riparian buffers are just a few of the versatile techniques used to maintain healthy forest ecosystems and provide for society's needs. Oregon's professional loggers and foresters continuously seek improved methods to manage the state's 27 million acres of forests -- showing how timber harvest is compatible with ecosystems. In 1996, Oregon loggers harvested 3.9 billion board feet of timber, enough wood to produce 4 million tons of paper products and build 260,000 homes.